The reason my father went to Brazil is not clear. In his Polish passport for 1946, he is not allowed to travel to Poland, only to Brazil or Palestine. It seems a passage to Brazil was provided for him by the American Joint Distribution Committee of Brussels but finding a ship was quite hard, with several delays and possible reroutings via Bordeaux and even Genoa, before success. 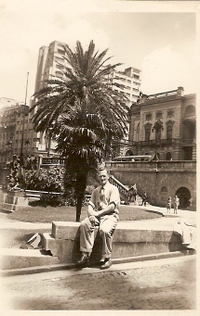 He was granted an extension to his visa by the Brazilian consul in Anvers (France) although emigration to Brazil had already stopped, and he finally embarked on 2 February 1947, hoping to start a new life. He seems to have been quite excited about going, but sorry to be separated from my mother, though they were not yet married. 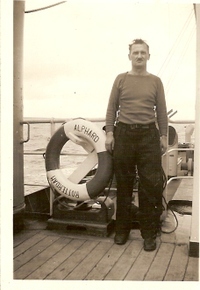 His voyage on the SS Alphard from Rotterdam was good. 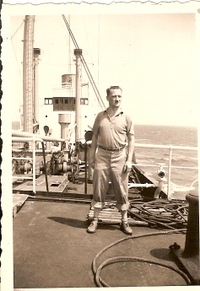 In December 1946 he set off for Brazil, working his passage. Here are the photos on the way out. I am writing today some words for the first time about this beautiful and marvellous country Brazil of eternal spring and about Sao Paulo, a very large industrial town where I arrived with a 13 hour train journey since I arrived on 20 February. The voyage took 18 days. I wasn't sea sick and the food was excellent on the Alphard. "On nous a traite comme des princes". Thank you for the letter to Anvers and the telegram which met me on arrival in Rio. When I arrived in Sao Paulo I was met at the station by the Comite du Joint (sic), who were very nice and provided food and accommodation for me. They met the expenses for the Identity Card so they could find me work. The climate is better than in Rio. But by mid May this was the story, and no letters survive from the intervening period. The exit stamp in his passport is 16 May. 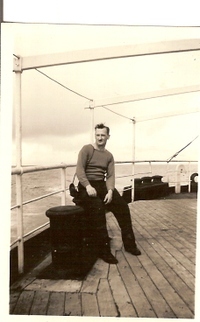 I am on my way to Anvers on the SS Paret de Loup Maritime Belge. I hope to arrive at the end of June. The middle picture appears to be the party which always occurs when crossing the Equator. What happened to change his mind and make him return? One answer has always been that my mother was pregnant. But this never seemed sufficient since, it was planned that she would follow him and they had already planned to get married. Nevertheless there always remained some doubt in my mother's mind that he might have preferred to travel round the world, rather than get married and settle down in England. Another answer from my mother was that the climate did not agree with him and he did not like living on beans, which seemed to be the staple food on offer. There was no problem at first. He managed to get a work permit and permanent resident status, since these documents survive. In fact it is from these documents that we learnt that his parents were called Michail Kosmyryk and Helene Estermann. But two short letters from a doctor show that all was not well. The first says he is not fit for work on account of the climate, and the other is a character reference to recommend him to friends for work. The letters are on headed notepaper from a psychiatrist at the Hospital de Juquieri, Sao Paulo. When I showed the letters to our Brazilian cleaning lady, her first reaction was to say that the hospital had been a notorious place for doing electric shock treatment and lobotomies, though now it was closed. Probably this reputation was earned in the 1960s when this was more fashionable, and not in the late 40s. At the time, my mother was a psychiatric nurse at the Cassell Hospital (a famous British psychiatric hospital) which had been relocated in war-time to Stoke on Trent. Perhaps she had found someone for him to visit there. Perhaps the doctor was just an acquaintance. Nevertheless, in view of his later medical history, one wonders. Another surprise was the certificate Nick was said to have presented to Rose when they got married. This stated that he was single, and did not have either venereal disease or tuberculosis. We always thought this was a huge joke. No one was more astonished when, after he died, this certificate actually turned up written in Portuguese, so it must have been obtained in Brazil. He was certified free of a lot more as well, though quite how they knew it on a cursory examination is not clear. Leprosy? Elephantasis? Narcoman? 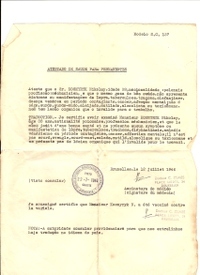 If one assumes he only went to Brazil because he had no choice, and his Polish passport expired on 27 June 1947, he made it back to Belgium just in time. The Belgian authorities clearly let him in, but what identity document did he have after that? It's not really clear. And finally there is the postcard to a mystery Sophie, from Brazil, addressed as "tu". Was she his sister? All was revealed later, when the documents arrived from the Belgian archives. *Still have to scan these.